lobstersquad: Cookbook review: "Every grain of rice"
For all the fuss about authentic recipes, I think they aren´t all that useful. I prefer true recipes. Take lamb, for example, done as they like in Castilla: roast in a wood fired bread oven, in an earthenware dish, with nothing but water and salt. That is the authentic recipe. The true recipe, however, would read something like this:"get into your car. Drive on the N-I until you get to Burgos. Get out, order lamb in a good restaurant"
Often, traditional, authentic dishes are weekend food, or restaurant or village fiestas food. Spanish people don´t have paella for dinner on a Wednesday at home, they have a couple of fried eggs. Which is why I recommend Fuchsia Dunlop's latest book, "Every grain of rice". Her two other books are a lot of fun, great reads, and her memoir, too, is excellent. They are one hundred per cent authentic. But this one, which has been out just a few days, has got me cooking straight away. I had to do a quick razzia on my Chinese market to complement my already bulging store cupboard. Yes, I already had sesame oil, soy sauce, chili bean sauce, chili oil, black bean sauce and several types of rice and noodles. I even had preserved mustard greens, but dried shrimp, where have you been all my life? I am going to cook my way through this book, I can tell. It´s full of doable, quick, really great recipes, simple, chock full of flavour. True home cooking, see? It´s reasonable: for every last-minute stirfry there is a long simmered braise or cold dish you can make ahead. The emphasis is on vegetables. It´s beautifully photographed, very well written, and the design is awesome. It even made me buy a block of tofu, so help me. That´s very powerful powers of persuasion, let me tell you. I am also doing my favourite cookbook game, which is to see which recipes I can adapt to the pressure cooker, to the Thermomix, and which to the steamer in the rice cooker. Yesterday we had rice (duh), over which I cooked some spectacular steamed chicken with Chinese sausage and shiitakes (pg 114). 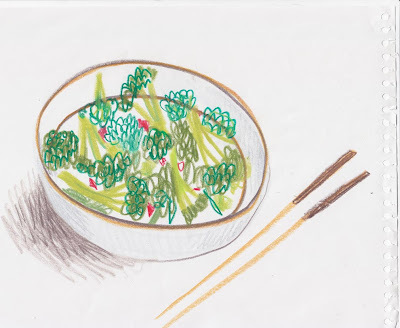 Spring greens with dried shrimps (pg 172). And an omelette with spring onions (sort of pg 132). My kids wouldn't touch the vegetables, of course, dammit, but they did wolf down the chicken and rice. I had meant to write about a whole other lot of cookbooks. Claudia Roden´s "The Food of Spain", for example. Great book. Or David Tanis´"A platter of figs", which I´d assumed would be smug and annoying but is a lot of fun, and full of things you might use for entertaining. Joanna Weinberg´s "Cooking for real life". Not as good as "Relish", but then again, nothing is as good as Relish. Dan Lepard´s "Short and sweet", a gorgeous, gorgeous book that I will surely be cooking a lot from. "Animal, vegetable, miracle", which I´d resisted for years, fearing it would be worthy and sanctimonious, but which turns out to be a great read. "Family life", a memoir by Elizabeth Luard, which I loved. And Béa´s "La tartine Gourmande cookbook", which is beautiful and warm and full of delicious stuff. And which makes me all smug when I say, "my friend, the author...". I won´t go into any of them at length, and I won´t write about the ones I haven´t liked, since I feel happy and positive today, because it´s sunny and summer solstice means different things when you live in the north pole. Going off to make some fried rice for lunch. Posted by lobstersquad at 1:49 p. m.
Thank you for all the great cookbook suggestions! Enjoy the day; the diminishing daylight is still a few months away.